Despite being one of the longest running racing series, Need for Speed has lacked a clear identity in recent years. I think Ghost Games and Electronic Arts has finally nailed it, though, with Need for Speed Payback. Described as an “action racing” game, it combines intense street racing with an open-world filled with cops and events to get into. Oh, and there’s also a Fast and Furious-esque story that brings with it some completely ridiculous blockbuster film moments. Players control three different characters in Payback, and each of them brings with them their own charm. There’s the charmingly egotistical off-road specialist Mac (I think it’s the British accent), a street racer punk named Tyler (I’m waiting on my royalties), and a sassy escape driver named Jess. Throw in a mechanic that complains about being too old for this type of tomfoolery, and you’ve got a cast of characters that’d fit into any street racing movie. Story is definitely a focus in Need for Speed Payback, but the three characters also factor into the gameplay. There’s a total of five types of events to compete in (Drag, Off-Road, Drift, Race, and Runner), and each character heads up the areas that lean into their strengths. Since a Lamborghini isn’t going to do well in dirt, players will need to have different types of cars available. This ends up working really well as players are forced to spend time with all three of the characters throughout the game, and there’s a good reason to purchase cars beyond simply wanting some new eye candy to look at. Need for Speed Payback has a huge open-world to explore, and while there are smaller events (like drift challenges and billboards to break) that serve as a general distraction, it’s the main missions that make up the meat of the experience. These regular events all tie into the story as players have to defeat the different racing crews around Fortune City (a fictionalized Las Vegas) in order to take down a crime syndicate. It’s all pretty silly on a base level, but the characters are all likable enough for it to work as a plot device. Once players defeat a couple race crews (which is done by besting them at their own skills, so expect to do off-road races against an off-road team) the story will actually progress through a “blockbuster event.” Unlike the standard races, these are cinematic missions that have the entire crew teaming together to pull off car heists and other craziness. These are a real highlight of the experience, as they provide some fantastic moments that’d fit right into a Fast and Furious film, but unfortunately there’s only a handful of these missions in the game. The scarcity certainly makes these events feel special, but I would’ve liked to have seen a few more of them. After all, destroying a helicopter via dope street racing is always going to be cool. While I wound up enjoying all of the standard events (although I found drifting to be strangely easy compared to the rest), I found drag racing to be the most fun. This is the event that feels the most different from the others, as it requires players to manually switch gears, and time their starts. It’s a much more technical driving, and it works really well as a great change of pace. 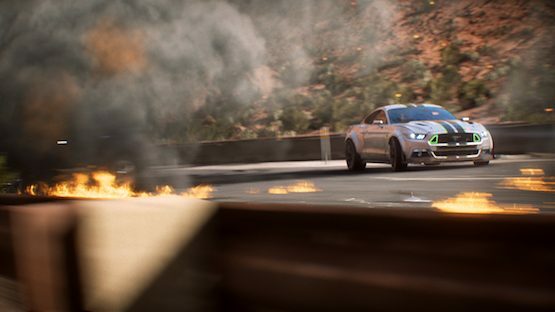 The actual racing in Payback is fast, and a mastering of drifting around corners is essential to success. Players won’t make it very far without learning when to hit their e-brake to whip their car around a bend rather than slowing down. It feels great, but its also quite unforgiving for an arcade game. Many of the events require near-perfect runs to complete (there’s no rewind like in Forza Horizon), and later races are over 10 miles long. That’s asking a lot from players, and it ultimately feeds into a grind of having to constantly upgrade your car’s parts (which oftentimes means doing side-events or playing old races in order to get cash). Having a performance advantage is enough to allow players to make a mistake or two, but even when I was overpowered there wasn’t much room for error. Part of this grind comes down to car customization, which is split into performance and vanity spectrums. The latter means that it’s fully possible to equip your vehicles with hilarious car horns, colored smoke, and other items. Sadly, there’s some poor user interface when it comes to customization as navigating the cars in your in-game garage is a total hassle, and shops only refresh their items every half-hour, which means a lot of waiting around when you just want to purchase a better exhaust. These design choices don’t result in a better player experience, and merely get in the way of enjoying the gameplay. 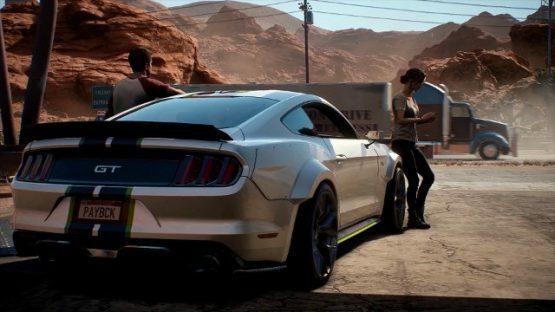 Need for Speed Payback feels like the natural evolution of the series, and that’s a good thing considering the game ends with a great tease for a potential sequel. While I finished the story in around 15 hours, it’s worth noting that there are a ton of side events and collectibles that I failed to collect in that time. I could see myself easily doubling my time within Payback, and do so with a smile on my face the entire time. Need for Speed Payback review copy provided by publisher. Version 1.02 reviewed on a PS4 Pro. For more information on review scores, please read our Review Policy.